Antiperspirants are considered the first line of treatment for excessive sweating of the underarms, hands, feet, and sometimes face because they are the least invasive and are relatively inexpensive. We recommend that they be tried first, before other more invasive treatments. The active ingredients in most over the counter or clinical strength products is aluminum chloride. When applied to the skin they create a crystallized plug that is pulled into the pores of sweat glands that then blocks the duct and prevents the sweat from reaching the surfaces. Over time the plugs either break down or get washed away. There are several clinical strength products that contain higher concentrations than the standard over the counter products. Drysol® is a prescription strength antiperspirant with even higher concentrations. A common side effect of the stronger products is skin irritation, and therefore these products should not be used too frequently. They can be applied not only to the underarms but also on hands, feet, or onto the face. Its best to be applied at night when sweating is typically much less. Make sure the skin is dry before applying the product. When using a higher strength product, only apply it three times per week, as more frequent use can result in severe skin irritation, and cracking of the skin. It’s unclear whether wrapping the hands in plastic wrap, (occlusion technique ), improves the results. The higher concentration aluminum chloride products can stain clothing or bedding, and that’s another reason why its often recommended to wrap the hands with plastic wrap. If the higher concentration formula is applied to the under-arms at night, wear a T-shirt to prevent staining of bed linens. 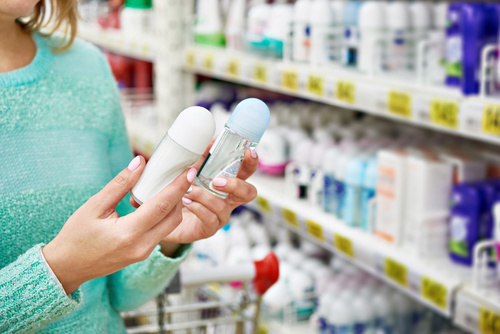 Response to antiperspirants will be seen after several weeks of use. Use of antiperspirants can be combined with other treatments, for instance iontophoresis treatments can be used in conjunction with antiperspirants on the hands or feet. Anticholinergics, an oral systemic therapy for excessive sweating can also be combined with antiperspirant therapy. If there isn’t sufficient improvement in sweating, and improvement in quality of life, then moving onto another therapy such as iontophoresis, MiraDry®, or ETS is indicated, depending on the site or sites of excessive sweating.